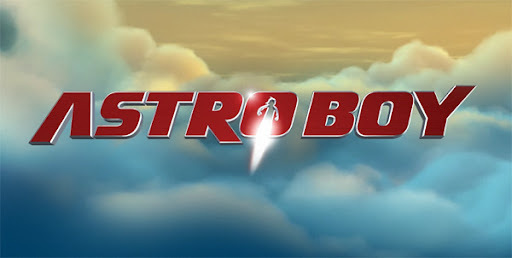 A thrilling tale of a true hero, Astro Boy is an all-new, feature film full of action, adventure, humor and heart. It will be brought to life on the big screen in breathtaking CGI animation on October 23rd, 2009. Set in futuristic Metro City, Astro Boy is about a young robot with incredible powers created by a brilliant scientist named Tenma (Nicolas Cage). Powered by positive “blue” energy, Astro Boy (Freddie Highmore) is endowed with super strength, x-ray vision, unbelievable speed and the ability to fly. 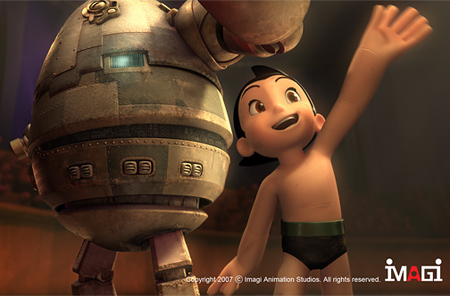 Embarking on a journey in search of acceptance, Astro Boy encounters many other colorful characters along the way. Through his adventures, he learns the joys and emotions of being human, and gains the strength to embrace his destiny. Ultimately learning his friends and family are in danger, Astro Boy marshals his awesome super powers and returns to Metro City in a valiant effort to save everything he cares about and to understand what it takes to be a hero. Wow this was made by the same company as the one who did Teenage Mutant Ninja Turtles! Really? Hmm well I await to see how the beloved character is brought back to life via modern technology. OMG!! Im so excited about this!!!! This movie will be a 50/50 thing with me. I was never really a fan of the Astro Boy anime....neither the old B&W nor the newer one released some years back. Astro Boy and Speed Racer are actually the only anime's i can't stand. But I will give this movie a chance as it does seem really good from the trailer previews. I havent read this summary from wiki yet and not going to until i see the movie but im posting it cuz im awesome and because some people may never have heard of AstroBoy before and might want to have a little info about it. The film begins In Metro City, a city that floats above of a robot junk-infested Earth. Toby Tenma finishes a physics pop quiz ahead of all his classmates and is free to leave. Outside he is greeted by Orrin (the family servant robot) and then greeted by a hologram of Dr. Tenma, Toby's father, who once again cancels plans they had because of a demonstration at the Ministry of Science and Dr. Tenma tells Toby not to come. Toby disobeys his father anyway and heads to the Ministry of Science. At the Ministry of Science, Dr. Tenma, President Stone and Dr. Elefun are working on a project with 2 cores, a blue core and a red core. The blue core represents positive, while the red core is the opposite. Meanwhile, Toby is placed in a room to be kept in until the end of the demonstration, but escapes and runs off to the demonstration room. They place the red core in a big machine called "The Peacekeeper". But when they then test its power, they soon realize that it is too powerful. When the scientists realize that the peacekeeper is too dangerous, they lock the room with a glass window, trapping Toby in the process. Dr. Tenma is unable to open the security door because The Peacekeeper fried the circuits. The Peacekeeper causes an explosion in hopes of destroying the door, but Toby is killed in the process. The Peacekeeper tried absorbing the door and the soldiers shoot it. Dr. Elefun pulls a cord with positive power and holds it up to The Peacekeeper, shutting it down. Dr. Tenma only finds Toby's hat. Soon after, Dr. Tenma is holding blueprints of a robot replica of Toby, in hopes of recreating his son. He takes hair from Toby's hat to access all his memories and place them in the robot. Dr. Elefun arrives with the blue core, as per Dr. Tenma's request, but warns him that the power may be unpredictable. All the other scientists worry about Dr. Tenma's sanity with this project, but Dr. Elefun assures that they would feel the same if they lost their son the same way. Dr. Tenma places the blue core into Toby as his heart and Toby comes to life. Dr. Tenma is ecstatic that the robot Toby is a success and takes Toby home, vowing to do all the fun bonding activities that he never did with Toby. The next day, Toby wakes up finding his father sleeping by his bed who ensures Toby that nothing is wrong.  When Orrin sees Toby, he is shocked to see him alive, but after scanning him, he discovers that Toby is a robot and Dr. Tenma tells Orrin not to reveal that Toby is a robot. Dr. Tenma tells Toby that he is no longer attending school and that he will be home schooled by his father. During his lessons, Toby is distracted by a book on flight and plays with Orrin with models of Leonardo Da Vinci's flying machines. When Dr. Tenma finds them fooling around, he discovers that Toby doesn't have the same interest as his real son did (loving old books on theories and his science hat) and sends him to his room. Dr. Tenma calls Dr. Elefun, fearing that he may have made a mistake. Dr. Elefun makes a point that Toby cannot be exactly duplicated. Dr. Tenma grieves over the fact that whenever he sees Toby, he is reminded that Toby is really gone and will never come back. While in his room, Toby worries about his father, since he has never been that angry with him before. While Toby gets into a quarrel with cleaning robots outside his window, he discovers he can understand them but falls out the window only to discover that he can fly! President Stone discovers Toby's energy signature and his blue core, believing it to have been destroyed, and orders his troops to capture it. When Toby returns home he overhears his father talking with Elefun about deactivating Toby. Dr. Tenma reveals that Toby is only just a copy of the original Toby and that he no longer wants him since his face only reminds him of his real son and the pain of losing him. Devastated, Toby flies off but not before Elefun assures him that he has a place somewhere in the world. While Toby sits atop a building scanning his hands, he is ambushed by military drones. Toby is shot at by multiple missiles and falls to the Earth's surface. Toby wakes up in the trash land below Metro City filled with broken robots where he meets a robot dog, Trashcan. Trashcan leads Toby to a trap where he is wrapped up ad captured by a group of kids, but released when they see he is not a robot. They introduce themselves to Toby, but before he can respond, a group of robots kidnap him. The group is the R.R.F (the Robot Revolutionary Front) who save robots and name Toby, Astro. They then warn him of Hamegg who enslaves robots. Just then, Cora busts in and takes Astro. President Stone arrives to arrest Elefun and learns of what Dr. Tenma did with the blue core. He promises to deactivate Astro when they capture him and give Stone the blue core for the Peacekeeper. Cora takes Astro to their home, filled with tons of kids...and Hamegg. However, Hamegg isn't as evil as he seems. Hamegg eagerly welcomes Astro into their family. Later that night, Hamegg talks with Astro and how he used to work in Merto City with Dr. Tenma, but was thrown away due to his "intimidating brilliance". The next day while out searching for parts, Trashcan tried to tell everyone else that Astro is a robot, but fails. (Trashcan writes on the ground "He's A Robot" but then one of the kids comments "Makes me wish I knew how to read.") Astro finds a 100 year old robot named Zog. Using the power of his blue core, Astro revives Zog. They take him back to their home and fix him up for the robot games. But Astro is slightly upset when he discovers that it is a fight to the death. Before the games start, Hamegg electrifies Astro and reveals to everyone that he is a robot. So, Hamegg puts him in the games. Astro easily clears all the robots but is put up against Zog, who refuses to fight Astro. Hamegg, forcibly tries to get Astro to fight, but Zog attacks him (being over 100 years old, the rules of robots not being allowed to harm humans doesn't apply to him, since it has been the rule for 50 years). Just then the military arrives and Zog tries to defend Astro, but Astro stops Zog and goes with the military. Astro is taken back to the lab he was made in and Dr. Elefun tells him that he is wonderful and none of this is his fault, but Astro believes that it is hard to fit in and that perhaps this is his destiny. Dr. Tenma takes out the blue core and apologizes to Astro, who says he shouldn't be sorry and apologizes for not being a better Toby. Dr. Tenma gives Stone the core, but betrays him and takes it back, putting it in Astro. Astro wakes up wondering why Dr. Tenma has done that, but he replies that even though Astro is not Toby, he is still his son. Astro escapes so Stone uses the red core to reactivate the Peacekeeper, however, the Peacekeeper absorbs Stone and heads to destroy Astro. With the entire city cleared and the Peacekeeper souped up with a bunch of weapons. Meanwhile, Cora and the others hijack Hamegg's car to head to Metro City and help Astro. But when the Peacekeeper tries to absorb him, it doesn't work. Dr. Tenma says that if the blue core and red core come together, Astro and the Peacekeeper will die. Either way, Astro flies into the Peacekeeper and they explode, leaving Stone unharmed, but arrested and Astro deactivated since the blue core has been drained. However because Zog was revived with the blue core, he returns some of the energy back to Astro, reactivating him. Astro finds his place as a hero and everyone rejoices. Cora reunites with her parents. But before any celebrating can happen an alien attacks and Astro, now at peace with his robotic nature, immediately launches into action after reassuring his concerned father, "I was made ready!" aHH...ok i'll use that next time eh?? yeah the code is "spoiler"
Subject: Re: Astro Boy returns!